Just want to give a shout for my favorite game. 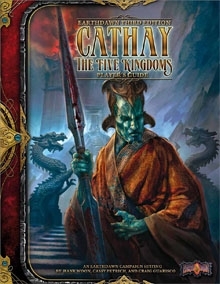 Redbrick LLC has just released their newest source book, Cathay The Five Kingdoms. This highly anticipated release is now available in PDF format at DriveThruRPG.com. Unfortunately, I can only justify one purchase, so I will be waiting for the hardback version to come out in January. If you have chance, take look and tell me what you think. T he gods are mean and spiteful entities that show little compassion for the hard work of others. As game masters, we put much into our games and give very little credit to those inspirations. We are the gods of our worlds. The weaver of tales for the amusement of other gods, we transmute the work of others to weave a tapestry to our liking. Well, that may be a little much, and many of us like to give credit where credit is due, but, in the heat of the story, we often fail to cite the sources of inspiration. This is not a fault; breaking the storyline to explain the history of your story/creature/etc would detract from the game. And remembering to credit everything that happened after 8+ hours of gaming is excessive. Still, I often like to explain my reasonings after the game to those interested. While sitting about on this lazy Saturday afternoon I came upon the 1985 movie 'The Adventures of Hercules'. Watching the scene where Hercules fights Aracne, the Spider Queen, I thought of Lolth, the Demon Queen of Spiders, and made me think if the two were related in any way. The original story of Arachne was a human weaver so skilled she challenged Athena herself. Although she did not loose the challange, her pride was her downfall and Arachne killed herself when Athena destroyed her work. Athena took pity on Arachne and turned her into a spider. In this version, and the version in 'Hercules: The Legendary Journeys', Aracne/Arachne is the queen of spiders (pictured her e). This can hardly be considered the source for Lolth since the adventure 'Descent into the Depths of the Earth' came out in 1978. Even still, Dungeons and Dragons is rooted in mythology and greek is not the only one around. Africans have a trickster that is a spider by the name of Anansi, the aztecs have Teotihuacan, the spider woman, and Peru has a spider god in its mythology (I tried to find the name, but it eluded me). My final question would be, if the two would fight who would win? I would have to say that Arachne would be an elder god, around since the times of the Greeks, but her powers are weak and her followers are few, if any. The upstart Lolth is new, not even a hundred years old, but her following is vastly greater due to gamers around the world. This fuels her power and presents her as a threat to Arachne. If it were put into my world, Lolth would be defeated in a climatic battle with Arachne, who used her guile and wisdom to defeat the young upstart and take back her rightful place among the gods and renewing her followers from the ranks of the drow, but that's just me. Wishing everyone a most joyful thanksgiving, I come to think of similar festivals about giving thanks to life's bounty. The most prolific is the Chinese Mid-Autumn Festival, also known as the Moon Festival or Lantern Festival. Harvest Festivals have been around since pagan times and is appropriate for most fantasy games. I recall a short adventure in the Polyhedron magazine where the characters are hired as 'turkey herders' to help get the turkeys to sale. Combine this with an autumn festival and you have a Thanksgiving inspired theme. How do you portray festivals in your games? Today was a good day for bargain game hunting. While I am not an advocate for the new Dungeons and Dragons, I do enjoy reading adventures, good and otherwise, for inspiration. I am even willing to pay if the price is reasonable. While visiting the local used book store, Half-Price Books, I came across two 4th Edition adventures still in the shrink wrap. They retail for $24.95 each, but they were $12.48. To make this an exceptional find, I had a 50% off coupon, it was only good for one mind you, making the adventure $6.24. This is the price I used to pay for adventures back in the 80's and the nostalgia compelled me to purchase the books. The two 'm odules' I found were "Death's Reach" and "Kingdom of the Ghouls", two epic level adventures that are part of a trilogy that finish off the shadowfell series of the new edition. I am not one for sweeping epic story lines; I find the meager efforts of would be heroes trying to scratch out a name for themselves more interesting, but I digress. The adventure come in a folder format with two adventure booklets and a map. I have not yet read through them but a quick look over does not appear to win my favor of the series. None the less, I look forward to reading them and if nothing else, I can usually use the map in one of my custom adventures. If you have any opinions of these two adventures, please feel free to share them. Your travels may vary, please take what you like and leave the rest for the next adventurer. Ok, so now we have a concept of what we want to work with, let's come of with a travelling troupe of performers. Clan FyreTwiste is comprised of five dwarves that perform various acts for the amusement of crowds the realm over. Although dwarves appear as a dour lot, clan Fyretwiste is a contrast to that, performing their acts with zeal and mirth. Intermixing comedy into their acts, the group plays on the popular misconceptions of dwarven society. Ironically, this funny to both dwarves and non-dwarves alike. Where non-dwarves see stubborn taciturn dwarves, dwarves see frivolous unthinking non-dwarves. This allows the troupe to play in most cities and they know enough to not make fun of the local politics. Below is a list of the five key members of Clan Fyretwiste, although you can add more members to suit your campaign. Kharnov is an illusionist skilled in the ways of deception. Kharnov has found that the best way to use his illusions is to aid others to make their actions more 'miraculous'. Flames burn higher and hotter; escapes are narrower, and the acts are more death defying in Kharnov's shows. Kharnov never uses his illusions to suspend disbeliefs and all of his troupe are able to perform their acts if he is not up to casting spells. Dwimli Firefoot is Kharnov's cousin. Once an apprentice to royal weapon-smith, Dwimli accidentally dropped a hot coal on to his boots and did not notice until it burned through the leather to his foot. His 'fire-dance' not only ruined the weapon being created for the prince, but cost Dwimli his station. Enthralled by fire, Dwimili spent several years studying with the firemages of his clan but proved not to have the aptitude to be a firemage. Setting out in the world, Dwimli traded his knowledge of fire and smithing for work while travelling. Upon returning to his clan, he had learned much about fire from other cultures and claimed the title of 'fire-eater' from the Far East. He performed what he had learned for the king, including an elaborate firedance with a firestaff and blowing large gouts of fire. He had also learned the secret of flame and smoke powder in the Far East. When asked to reveal his secret, he declined saying he was honor bound to keep the secret from non fire-eaters. Dwimli was exiled from his clan, but not before Kharnov saw his worth and left the clan with him. Until Kharnov found Rizzo, he was your typical dwarven mercenary. A hired sword to the highest bidder. Although he had a weakness for dwarven ale, Rizzo was not to be trifled with when sober. Kharnov found Rizzo in a fight between three human thugs and what Kharnov noticed was that Rizzo had a flare for the dramatic and almost appeared to dance when he fought. This was contrary to the dwarf teachings of a staunch defense and a rooted stance. After the fight, and several rounds of ale, Rizzo admitted to training with elves and learned to blend elven sword dancing with dwarven defense stances, the result was a unique style that appeared unrelated to either. Ghenna was slave performer for wealthy human merchant. Being a slave since birth, Ghenna has never known another lifestyle than that of servant. She was trained in many dance techniques, and was one of her owners favorite dancers. She was often overlooked for other activities, like dinner companion, where usually a more attractive slave of human or elf disposition was chosen. This forced Ghenna to excel in her speciality, but never brought her the attention she desired. When Kharnov had business with Ghenna's master, he was insulted at the disrespect the human showed dwarves. Not willing to face him openly, Kharnov baited the merchant into a illegal deal and double crossed him to the town guard. He had already cut a deal with the town magistrate and the merchant willingly released Ghenna to the Magistrate rather than loose his business. Kharnov released Ghenna from servitude, but she did not know what to do with her new freedom. Kharnov allowed her to stay with the troupe and soon found she was indispensable for luring the crowd. Her frame was lithe for a dwarf and her exotic dancing was always a crowd pleaser. She is fiercely loyal to Kharnov, who shows her more attention than her last owner, but still calls him master against his wishes. Airgo is the main performer of Kharnov's show. 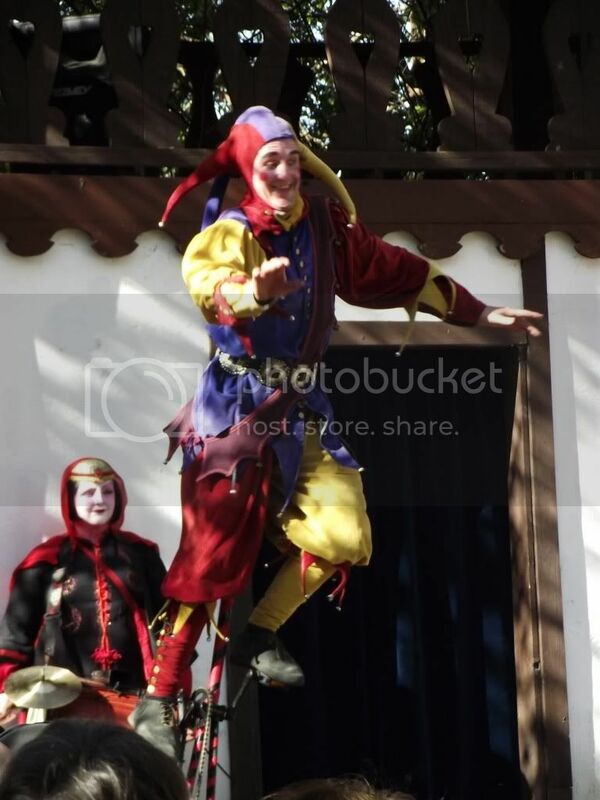 He is classically trained in performance and his talents range from acrobatics, to juggling, to comedy. He often coaches the the other members on how to perform in various acts. Airgo is also the only member that Kharnov didn't find, but showed up one day and offered his services. Before meeting Kharnov, Airgo was an out of work performer who turned to thievery to support himself. After a particular heist went bad, Airgo needed to get out of town quickly. After running into to the troup, Airgo quickly realized he could offer his skills in trade of some companions to share the road with. Since then he has grown accustomed to the group and enjoys being looked up to by the other performers. While he often butts head with Kharnov, he recognizes kharnov's talents and the loyalty the other members show him. So next we'll look at plot hooks, these are general plot hooks on how you may use Clan Fyretwiste in your game. I divided them up into three categories; the good, the bad, and the ugly. Each category has a brief descriptions on the troupes outlook to help define how to role-play them. On the good side, the travelling troupe are honest people who like to entertain. They make their living on the goodwill of strangers, but not everyone is as welcoming as they like. Clan FyreTwiste has chosen a bad time to visit a village. One of the villagers has killed another member of the community. Seeking to diffuse blame, the performers are strangers to community and the perfect scapegoats. The players are approached Kharnov and asked to help clear their name. Now the players must find the truth before the village turns violent. Two of the members the troupe have gone carousing and have yet to turn up; this works best in a larger town. Kharnov is in a panic because several premier seats to the show have been sold. One of the missing members is Rizzo the Sword Dancer. Kharnov sees one of the player characters that appears to be able to handle a sword and hires him to take Rizzo's place. Rizzo, who is slightly inebriated, returns to see the PC performing his act. Thinking the PC is trying to steal his place, Rizzo hops on stage and challenges the PC to a duel. Now the PC must finish the act without loosing face, hurting the drunk sword dancer, or disappoint the crowd. Kharnov and his troupe are accosted by bandits and, not having enough money to pay the road tax, are taken prison and forced to play for the bandit's amusement. Kharnov is able to escape with his illusions, but he refuses to leave his friends to the bandits. After several days he comes across the PC's camp and beseeches their aid. Although he is unable to offer any significant sum of money, he agrees to pay them with the profits of their next several shows. On the contrary, if the Clan FyreTwiste performers are on the bad side, they are more interested in making money than actually performing. As long as the money is good, the troupe sticks to the routine. If the village poor or refuses to pay, the troupe uses alternate methods to increase their cash flow. The party is met on the road to a village and asked by Kharnov to assist the troupe as guards and general grunt labor. The pay is reasonable and seems a simple break from adventuring. At the next village, the meagre donation is not enough to appease the performers and they case the village for high value items. The last night they play a show that keeps the entire village out late and they steal what they can before high tailing it out of town in the middle of the night. The PCs awake the next morning to find the troupe gone and angry villagers seeking an explanation. Dwimli Firefoot is not only an adept fire eater, but his glibness has proved to be just as lucrative as his act. On the side, Dwimli sells a potion called Firesnake Tonic. Dwimli uses his fast talking skills to convince people that the tonic will cure what ever ails them. The tonic, which is nothing more than colored water with a few drops of firesnake venom, is actually a slight hallucinogenic that will make the person believe that it does, when he expects it to do. Kharnov is aware of the gambit, and uses his illusions to make the physical indicators more realistic. The problem with the tonic is that some people become violently ill up to a day after drinking it. The PCs are hired as guards and are forced defend the troupe as the beat a hasty retreat after too many people in the village become sick from the tonic. After the party stumbles into a village after many days on the road, a village elder asks the PCs to retrieve an item of religious significance from a band of performers who left earlier that morning. The PC must track the troupe and get back the holy object of the village. The only catch, blood spilt in the name of the idol brings bad luck. In this scenario, the travelling band of performers work for a more nefarious entity. It can be anything that fits into your campaign, but usually works best if it is an other worldly entity that personifies evil. The troupe will appear genuine is all aspects and may even serve the being unwittingly, but that acts that are performed are atrocious by any civilized community. The troupe performs acts for several nights and, if the PCs are in the village long enough, appear that village does not really have the coin to support the performers. The troupe is happy to play anyway. Kharnov's illusions are empowered to entrance the children of the village. The illusions are re-enforced each night until the final night when the children rise in sleep-like state and walk to one of the farming fields. There the troupe prepares the children for a ritual sacrifice before disappearing into the night. Unbeknownst to the performers, one of the PCs was captured by the illusion and sleep walks to the site. The PCs following him must now fight the troupe, and any of the entity's minions they have, in order to save their friend and the town children. In this scenario, the entity appears to offer people what they need, or want, but the price for such services is high. The troupe facilitates the demonic pact while trying to down play the cost of the service. Kharnov is very selective about who they approach and are sure to convince the mark that he does not want to share the information. The troupe may go as far as approaching others who care for the original mark to make additional infernal bargains. PCs leaving a town where the band has recently performed may noticed a child aged unnaturally beyond her years to take the payment of her father that sold years of his life to ensure his family had crops that year; the land is lush and green where it was brown and dying when they had come into town. A powerful lightning storms adds to the mood of the story while justify the crops renewed growth. The PCs are not asked to help against the performs, but can they let such evil run rampant through the country side. Every now and again Evil is trapped and unable to spread across the world. When trapped, it sits; it plans; in festers. In this scenario, a great evil had been plotting its escape for a long time, it has discovered the troupe as an instrument of its escape. Perhaps the troupe must travel to different village and perform sacrifices in the shape of some esoteric symbol around where the entity is trapped. Perhaps there is an item that the troupe must get, or replace, that will free the entity. If the party is around the performers for any length of time, they will notice that something is not right in the towns that troupe visits; death and mayhem appear to follow the performers. The PCs can follow the troupe to find out what is going on, but may have to battle an infernal beast for their troubles. I am curious as to your others ideas for this concept, so please feel free to add members or plot hooks to this post. I made it out to the Texas Renaissance Festival this weekend out in Plantersville. I generally go on opening day because the crowds are not dense at the beginning of the season. That was not the case this year, and the crowds were in full swing, make the festival seem closer to the end of the season than the beginning. My wife likes to watch the shows and while I reluctantly sit through the shows, I usually can’t help but feel I may be missing something that year; we only go once per season. This year though, I took a different stance on the show and decided how I could incorporate the show into a role-playing scenario. The first show up was a band of traveling performers that centered around juggling, mixed with comedy. The show was not the worst I had scene, but the name of the troupe is what really caught my eye. 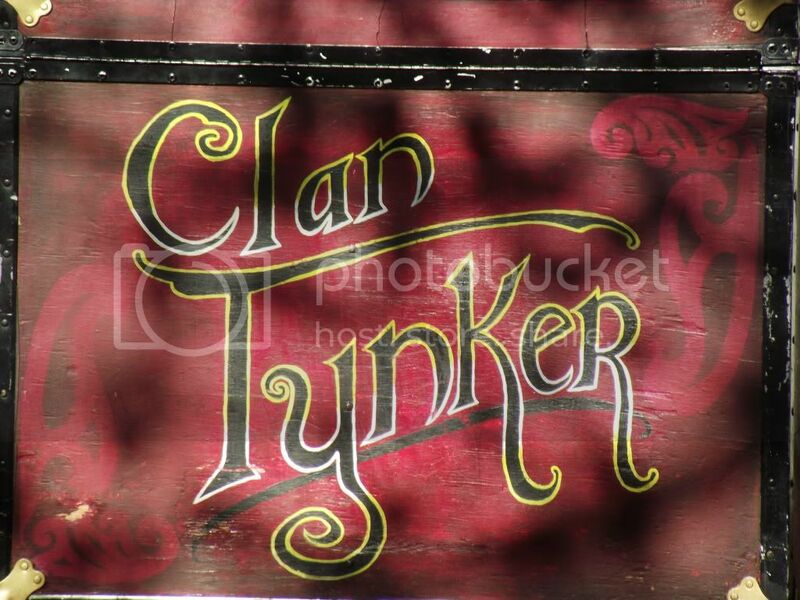 This group of performs were siblings that went by the name ‘Clan Tynker’. I found the idea of a group of traveling dwarf performers by that name a mirthful concept. You may want to use gnomes, but I think a group of acrobatic, juggling dwarves ironic in concept. The five members of the group consisted of the headmaster Santiago, who narrated the show, announced the various acts, and informed the audience of the historic and ethical origins of each act. Elijah, was the main juggler of the show, performing juggling with several different objects and some sword swallowing. Serendipity wore a full oriental inspired outfit as well as facepaint; she performed various oriental style dances with ribbons and flames. Rebekah assisted in most acts, performing the same skill in the various acts as the others. She was often the playful nemesis of Elijah. The final member of the troupe Sam, also helped support the acts that required more than one person, when not performing he played a large drum and added heckling to the performer on center stage. You can see more pics of the show at the following links. So how do you use this in your campaign? Well the uses are only limited to your imagination. Instead of rattling out some quick concepts, I’m gonna take a few days to draft up a non-game specific traveling dwarf performers. Add in a dozen or so plot hooks and you can fill in the rest. If you have any ideas of your own please feel free to post them. Holy albino griffins, there are people following me??? Thanks to everyone who have added me to their list of people to follow. I appended the blog entries to include some posts from the old blog. There are a few more that I left out, but those were added by other authors. Please feel free to comment on them. I'm planning on doing a review of an D&D 4th edition product, so look for that in the near future. I live out in the country about 20 minutes from the nearest small town. Life out here is a little different and, for me, sometimes a little creepy. Last night I was loading some stuff into the SUV for the next day when the dog starts barking at the darkness. The moon was not out, so I only had the light from the porch to see and it only goes about 30 feet. As I peered into the abyss, you know the kind when you lean forward hoping that the extra three inches will improve your site distance, two huge apparitions came lumbering forward swaying from side like creatures from Stephen King's "The Mist". Now they were not moving fast enough to startle me immediately, but I was taken aback at their proximity. Standing half way between the SUV and the porch, these two ghostly creatures were only twenty feet away when they slowly came into view. The fact that the dog was barking incessantly at them the whole time is probably what set me on my nerves. "How would an actual adventurer feel when confronted by unfamiliar creatures in the darkness of a fantasy world?" Well, since there are probably no travelling troubadours telling ghastly tales of Zombie Armageddon, they probably would not be as alarmed as I was. But if your characters are those stalwart souls that are constantly coming through battles by the skin of their teeth and the creatures you throw at them are from an endless horde of things that scurry in the corner of the light and feed off the entrails of the fallen, something as simple as two large horses can sure be creepy. For a while, I wanted to give kudos to the guys at Obsidian Portal. While the site began as a simple wiki for listing your game site, anyone who has created a website for a game knows the head-ache of not only providing content, but making sure the site is functional. While the site is not as robust as some of the Content Management Systems out there, it provides an easy way for gamers to create a campaign site that all the players can reference. There are various sections for game-log, characters, items, and a forum for the particular campaign. You search other member's campaigns (If they made them public) to help our with content if you're strapped for time. The even have dynamic character sheets for D&D and Shadowrun; They willing to make more if there is enough interest. The team at Obsidian Portal have won an ENnie award for best website two years running. The site impressed me enough to become an Ascendant Member; that's a fancy way of saying I paid for the service. You do not have to become an Ascendant Member to use the site, although it benefits the GM to do so. Well, I have waited too long since I posted an article. The year started off good and, as usual, life churns and everything becomes a tangled mess of putting out fires. This brings me to the topic I would like to discuss in this post, Game Continuity. Game continuity is something I learned at an early stage of game mastering, and I believe this lesson has garnered me praise for my games. I do not think continuity is difficult to employ, but using it does require an attention to detail, fastidious notes, and somewhat of a flair for the dramatic. So what is game continuity? Game continuity the ability to make a series of gaming sessions appear as one intertwined story. Continuity is more than just a ‘campaign’, although campaigns use elements of continuity. Continuity is allowing the players to draw the conclusions and realize there are forces behind the scenes they are not aware. I like to utilize pre-made adventures with my story arc. This allows me to utilize someone else ideas and blend them with my own to create a more detailed story. Some game masters like to use ‘home brew’ adventures. This is fine if you don’t fall into a flat arc. Often a game master will use his own adventure and the players will be railroaded into the story, making them feel like their actions don’t really matter. Other times the players feel that the game master is making stuff up ‘on-the-fly’ and that the he does not have the adventure planned out. Using a premade adventure, allows the game master to have a detailed plot to fall back on if the players go awry from the original story arc. If you can handle the detail, try running two or three premade adventure along with your own. This will confound the players as well as give them a sense that there is more in the world than they can handle t one time. Using multiple adventure also link stories together is such away that the transition from one adventure to the next is seamless. This requires some work, especially if you use premade adventures, but from my experience keeps the players more engaged. 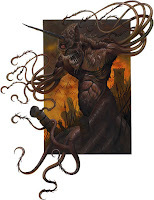 There are some excellent premade adventures out that can easily modified to fit a campaign. Do not be set a single gaming system either, I have modified Science Fiction adventures for fantasy games, the idea is to take what you need for your game. Be sure you keep good notes, when you create an non-player character out of the blue, write down the name. You never know when the merchant the party met at first level turns out to be an empire spy 7 levels later. If players do connect abstract references to previous games, award them experience. This will make player look for possible connections in the game a make the world more cohesive. I spend a good deal of time in resell shops. One of my favorites is Goodwill. At first I was against going to used good stores as I thought the items were poorly maintained and people were just looking for a way to get rid of their junk. There is a lot of things you will consider junk there, but if you are not looking for anything in particular, you can find a gem of a deal. I shop these stores and think “how can I use this in a game?” I can often find terrain that will spice up an encounter or something that may help me in a mundane way, like folders or clip boards for paper management. Sometimes I find steals and just wonder if the person putting the item out has no idea what it is. I found a color PDA for $3.00. It was an older model, but I was able to charge it up and it worked perfectly. 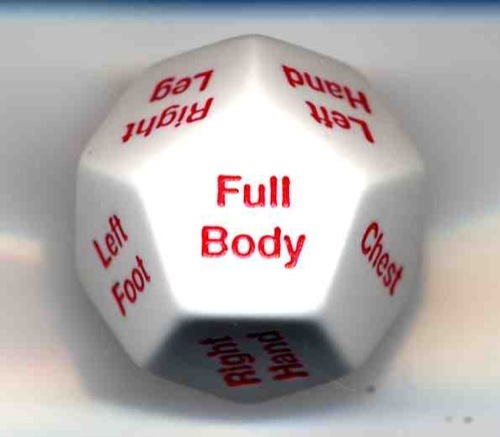 I found a free die roller for the PDA on-line and was able to use the PDA at the game (I have since abandoned the PDA as I roll horribly with electronic die rollers). The story of my most recent find starts on December 26th, our first game after Christmas. 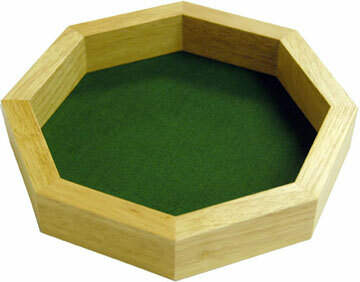 A couple of us gamers pitched in to buy the octagonal dice tray pictured here. We purchased the tray so our game master would not have to use the box lid from one of his board games to roll dice. We all got a laugh out of the “10′ wood” that was written on the box and the tray turned out to be a hit at the game as everyone tested its functionality. I couldn’t beat the price, so I purchased and brought the tray home. I was writing this article when the origin of the tray hit me… it belongs to a game called “Close the Box”. The game that is played with two people trying to eliminate numbers from one to nine. I believe this tray is half of a two tray set. I actually own a version of this game called Boc-tin, but the counters are completely different, they range from one to twelve, and uses a single area to roll dice. The other tray most likely suffered some mishap and a single tray is not very useful. So now I have found a decent dice tray with a nice counter function for whatever I may need it for. Total price for this item: 99 cents plus tax. Combat is one of the most time consuming elements of any role-playing game. I remember long drawn out actions scenes that enhanced the story we were creating. As I have progressed in my gaming years, the focus has moved away from details for efficiency, sacrificing fluff for crunch if you will. While this may work for many gamers out there, I feel it lessens the experience. No longer are my combats memorable scenes of questionable tactics and lucky saves; more often combat is reduced to target numbers and calculated dice rolls. So how do we capture the essence of combat, making it more like a scene from an action movie than scrolling DPS* numbers from the characters stoic attack stance. One way is to be more descriptive in combat. Don’t settle for the arbitrary, “He dies and falls down” as soon as his damage threshold is exceeded. Allow your final bad guy to remain standing two or even three rounds after he has died and describe each blow the characters make until the realize that the nemesis is no longer fighting back. Allow him to slump down in such away that the party is unsure who made the killing blow. Award players who add more to combat than just rolled numbers. I recall a friend saying, “I like my players to feel like their characters are in a John Woo film.” If a player wants to attempt a wild undocumented maneuver in a game, award him experience and then his penalties for the action. Another thing I like, is wound location. While this may add more o verhead to the game, I find a well streamlined system adds more to story telling than takes away from combat. I prefer the die method, and using s specialized die reduces the need to reference charts. Wound location should not change the dynamics of the game, and just because you roll a head shot does not mean you can ignore armor. Just remember that combat is somewhat abstract and a wound location just helps a player visualize his character’s current state. Let us know how you handle wounds in your games. I recently cam across an article discussing New Year’s Resolutions for the Role Playing Gamer, I decided that I would try my hand and see if I could hold true to my gamers word. Try a new game system – I did find Swashbuckler’s of the 7 skies interesting. I haven’t seen anything on the game, yet I have a desire to play a Lightening Pirate. If I can convince the group to play, I just may be able to pull off…. arrhhggg. Read Graham Walmsley’s awesome book Play Unsafe - I will have to give this a gander. Play a couple of one-shot RPGs - I don’t care for short one-shot games, things have a tendency to go off the deep end. I’m willing to give it a try… I just need to find the right one. Read a book on psychology, science, or history – picking up any book and reading it would be a good goal for me. I have so many books I will never be able to read (I’m a slow reader) that I’ll shoot for reading something not job related. Pull out a RPG you haven’t played in a while and play it – I would have to agree with the Dallas Wizard and say this would be either Star Frontiers or Star Drive. These two setting never got the chance they deserved. Since I own all the books for each game, it wouldn’t be to hard to get a game going. GM a game & play in a game – I don’t really have too much issue with, although I am in the stage to prefer being a player, I end up in the game master’s seat a lot. I should probably come up with some of my own, but this is enough for now. If you thing up any good ones drop me a note.